Crossing any protected border is a bit of a pain. Over the past few years we’ve had our fair share of problems at various border crossings. In China, we were told we had swine flu at one border and nearly quarantined. In Turkey we were stuck in no-man’s land trying to buy a visa. In Turkmenistan we were held for over a day trying to catch the border-ferry out. In Azerbaijan we were lectured about the evils of their neighbors and forced to promise never to visit Armenia. 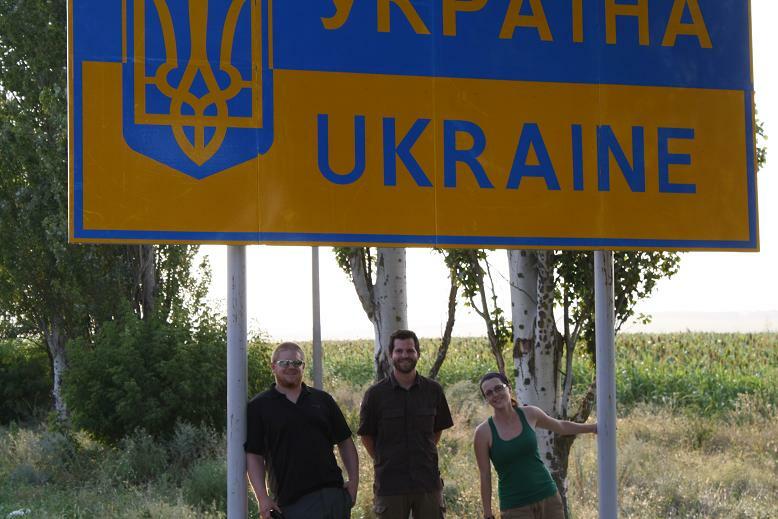 So, when we came to the Ukrainian border we were not that worried. No matter what problems arise, you always find a way through them. We had already waited several hours to go through the exit procedures for Moldova. We drove through no-man’s land and waited in a huge line to enter Ukraine. The line inched forward slowly, and rather than waste gas we simply put the cars in neutral and pushed them. This drew the strangest compilation of stares from other motorists and, of course, the Ukrainian border guards. We’ve since learned that these gentlemen don’t have a sense of humor. Round one is the maze. Basically, you run from window to window trying to figure out what they want and how to deliver it. One window wants your passport, one wants the car registration, one insurance, one just wants to look at you and whisper to their fellow guards, and one window has no purpose at all. While we were jostling for space at the windows another rally team walked up and introduced themselves. They drove an ambulance and had been held at the border for the past four hours since their V5 form was missing. In case you don’t know, it is required that you mail in your V5 form in the UK before exiting the country, so of course no one has the form! This was impossible to explain. The other team was waiting for someone from the embassy to call back and explain this to the guards. We stayed in line and eventually a guard came around the window and took Bill into a back room. We assumed this had something to do with either asking for a bribe or demanding we find our V5 form. After twenty minutes Bill emerged and said the guard just wanted to chat, practice his English. We finally got our passports stamped and our registration returned to us. Since I had not driven in quite a while I hoped in the driver’s seat and edged us out of the border area and into the straight away. The feeling of finally being out of the border area was so overwhelming that I wasn’t entirely surprised when I came flying over a hill and saw the police. A huge smile washed over the officer’s face when he aimed the radar gun. It was already too late. I slammed on the breaks but the gun was already coming down to his side and his other arm was waving me over. Bill and Mike had done most of the driving, I drive for five minutes and I’m pulled over in Ukraine. The cop came up to the window (confused at first as to why the steering wheel was on the wrong side) and showed me the radar gun. 76 in a 60. Not bad! I smiled and said I was sorry, but he walked back to his cruiser, waving me with him. I followed him up the hill (it had taken me a while to stop due to the speed/incline) and he started writing me a ticket. I told him I had no money and didn’t know that I was speeding. I explained that I thought the speed limit was 80, so in all actuality I was actually under the limit. He laughed and kept writing the ticket. I started to look desperate and told the other officer to help me explain the situation to the man writing the ticket. He never took the radar gun off the hill and every time someone swept by under the limit he would shrug and smile and look dejected. The ticket-man was explaining to Mike, who had joined us on the hill, that I owed 250 rubles. I said I had no rubles and started to shift my weight from foot to foot, looking lost. I was about to play the ‘cry on command’ card when the ticket man finally looked up and said ‘go.” I repeated this back to him and then smiled. I wanted to hug them both but thought better of it at the last moment and shook their hands instead. Mike ran down the hill and I followed. Despite the small fiasco I decided to keep driving. This time, under the limit a few notches.